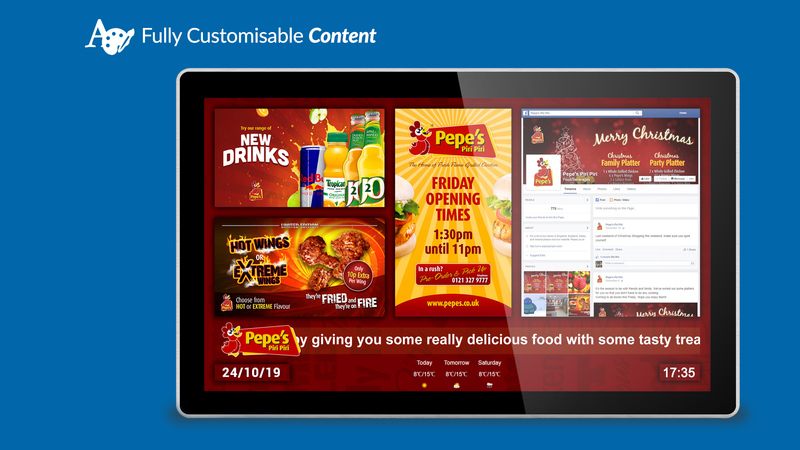 With our Digital Signage CMS you can send content from your PC to your display or media player in a matter of seconds using a user-friendly drag-and-drop system. We provide free technical support, by phone and email, even after your warranty period and server subscription has expired. Our CMS software is specifically designed to be used with the screens and media players that we manufacture; providing an all-in-one integrated solution. Stable, dependable performance 24 hours a day, 7 days a week that even runs and can be updated while offline. When changes are made the screen or player will only download new files, not the entire content. Using a wide range of screens and media players you can scale any project with absolute confidence. You can even integrate third party software via a URL. No need to install software to your PC or have your own dedicated server, our cloud-based Digital Signage CMS portal can be accessed instantly from anywhere in the world. Unlike other cloud-based platforms we do not put any limits on the amount of files or total storage space for your media or content. The hardware will download the media files that you publish to the screens and store them on the internal memory, meaning that even if the screen or player is not connected to the internet it will display the scheduled content. Pre-developed playlists, including the editable templates and the associated media files, can be downloaded and edited so you don’t need to start from scratch. One year, three year and lifetime subscriptions can be purchased depending on your requirements and circumstances. 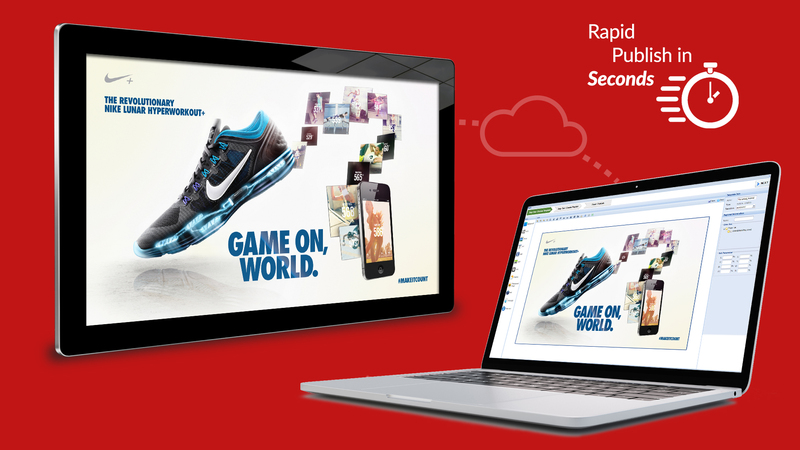 Design your own layouts in any orientation, with different zones for your images, videos, text and live webpages. You can upload your own background image or add in special zones that display the time, date, local weather forecast or even live television. Build multi-layered templates with background images or colours with image and video zones on top. Even add an image overlay with transparent sections to allow your content to shine through. 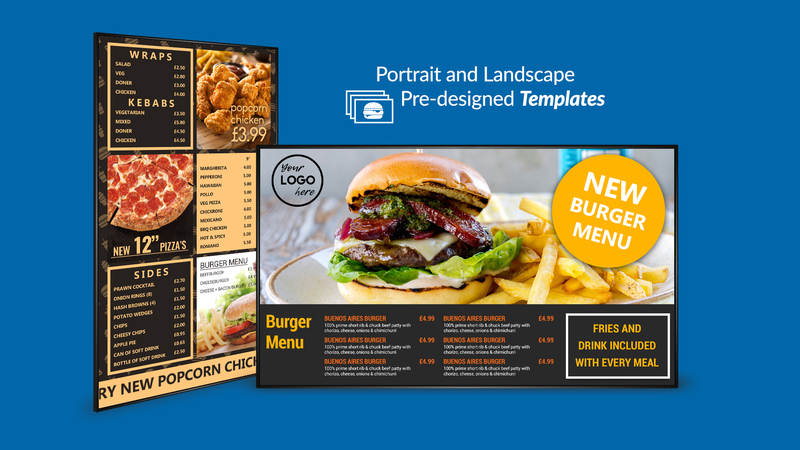 Use our digital signage software to give your image slideshow extra vibrancy by choosing from 24 different animation styles to transition between images. Add a fully customisable scrolling ticker message to deliver your own messages. You can change the direction, speed, size and colour of your text and the colour and transparency of the background. If you want to deliver more 'live' updates on your screen you can use an RSS feed for the latest news or any live up to the minute feeds. Alongside your media zones you can display the local time and date, various styles of weather forecasts, any social media feed and even live traffic updates. Either publish immediately or choose your own times and dates in the future for your content to display. For example during morning hours you can set a breakfast menu to display and after midday a general menu plays. You can schedule content as far into the future as you like. Create and manage as many user accounts as you like. You can customise the privileges for each user. For example you can allow a receptionist to change the welcome message of a screen in the reception area but block them from changing anything on other screens in the building. Send commands to reboot your screens, format the internal memory, stop and start content playback, adjust the volume of the screen; almost anything you can do with the remote control. No matter where in the world you can retain full control of your screen. Access, update and monitor your network of screens and media players no matter where they are and no matter where you are at any time. Monitor the status of your screens and players from the dashboard. Check the last time there was communication with the server and even the download progress of new publishes. Retrieve a snapshot of exactly what is playing on screen at any time. View and export records of user activity as well as communication between hardware and the CMS server. You can even export proof of play records to show how many times any given piece of media has played within a specific period. You can preview content before sending it to your screens or players to make sure it looks as you want it to. Synchronise your content across multiple screens or players that are connected to the same network. There are two distinct styles of synchronising content; you can achieve the effect of one large image or video across multiple screens/players at one time or have the same content playing and transitioning in perfect unison. Adding webpages to your layouts opens up a world of new possibilities. Display social media feeds, your company website, live travel and traffic updates or even a live web feed from 3rd party software. You can set refresh times on your webpages so they always stay current or even display multiple webpages within the same zone. Using our Android Cloud Network Media with Live Input you can display a live feed from an external source. So if you wanted to display Live TV in your layout, you can simply connect a set-top box to your player via HDMI which is then connected to the screen. It doesn't have to just be Live TV though; it can be a feed from any source via HDMI or VGA, such as a PC or security camera. As the hardware and software have been designed and developed to work in conjunction with one another you can achieve ultimate real-time control. As well as being able to send commands to stop and start content playback, adjust the volume of the screen, format the internal memory and even turn the screen on or off you can also set on/off timers, download and volume schedules as well as scheduling the screen to switch to the HDMI port for certain hours of the day. Robust tablet-like styling with tempered glass face, rounded corners, steel enclosure, super slim profile and aluminium surround. Commercial grade 450cd/m² IPS panel designed to run 24/7. Free super slim wall mount for landscape or portrait mounting. Integrated castors, which are also retractable, provide a fully portable solution. 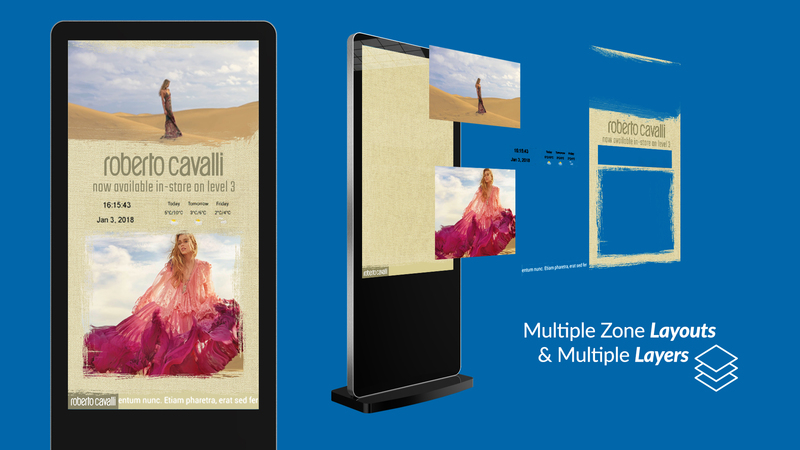 Narrow bezel - ideal when synchronising content across multiple screens. Commercial grade 450cd/m² panel designed to run 24/7. PoE – Power over Ethernet, provide power and internet access with a single cable. No integrated battery unlike domestic tablets therefore last considerably longer. Commercial grade 1,500cd/m² IPS panel designed to run 24/7. Ideal for most outward facing window displays. Commercial grade 2,500cd/m² IPS panel designed to run 24/7. Ultra resistant to blackening defect up to 110°C. Ideal for window displays with direct sunlight. Commercial grade 2,500cd/m² panel, with anti-reflective glass, designed to run 24/7. IP65 rated enclosure – resistant to water and dust ingress. Free lockable wall mount for landscape or portrait mounting. 65” and 70” and 86" models available. Connect to existing screen via HDMI or VGA. Display live input, such as from a TV set top box, as a zone on your screen.